The entire Granite Hill School community had the opportunity to participate in a project based learning activity. The school was split into multiple groups and given simple parameters. The goal: to build a sled using only a trashbag, a pile of cardboard, and duct tape. The challenge: can you build a cardboard sled in three hours that could go faster and farther than the rest. Throughout this process the students took the lead while staff was there to guide them. Each team was able to produce a working sled and were evalu- ated in multiple areas including a theme, teamwork, and distance. Each team worked together to develop a fictional team that they wanted to represent, including the Granite Hill Hippies, Team USA, Granite Hill Generals, and many more! This event took place during a school day and allowed the students to be innovative, take initiative, and show their creative sides. The winning team consisted of Junior High students and staff. 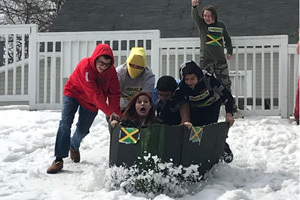 They modeled their sled after the Jamaican Bobsled team and created matching uniforms to boot! The second place team, the Granite HIll Generals, modeled their sled after a military-style tank. The third place team, Team USA, were sure to show their American Pride in their sled. The Cardboard Sled Race marked the second time this year the entire GHS community came together for friendly competition. The next competition, scheduled for the spring is Milk Carton Boats, where students will create a boat out of a milk carton and see which “boat” can float on the lake the longest.